The long-lasting hegemonic rule of President Hugo Chávez not only involved significant rearrangements in the control of political power in Venezuela but also shifts in the way its citizens constructed, connected and interacted with politics. 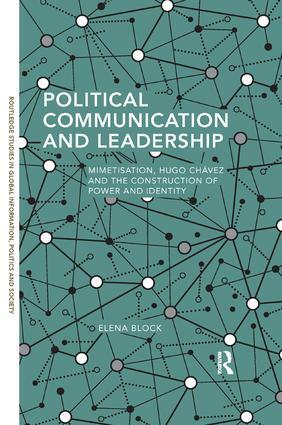 In this book, Elena Block explores the political communication style developed by Chávez to transmit his ideologies and engage with his publics — A style that unfolded incrementally between 1998, the year of his first presidential campaign, and March 13th 2013 when his death was announced after a long struggle with cancer. What sort of political communication did Hugo Chávez develop to establish hegemony in Venezuela? What made him so popular? Block argues that Chávez’s political communication style can be better understood through the concept of mimetisation, a systematic sequence of communicational events and practices whereby the Venezuelan President managed to build a bond with his constituents. Applying a mixed qualitative method of collection and analysis of relevant data, this phenomenon is examined via the President’s emotional use of common cultural symbols; dramatized and informalised language; savvy use of communication and media, and boost of inclusive, compensatory, and participatory practices in which his constituents not only felt mimetically mirrored, but also endowed with an identity. Shedding new light on contemporary theories of populism from the perspective of political communication and identity construction, the notion of mimetisation can be adjusted and applied to study the links of populist phenomena, the mediatisation of politics and government, cultural appeal and identity politics in other cultures and situations in contemporary times. Elena Block is Sessional Lecturer in Political Communication & Public Affairs at The University of Queensland’s School of Political Science and International Studies, and tutor in Mass Media and Society and Mass Media, Spin and Public Opinion at The University of Queensland’s School of Communication and Arts. Her main areas of interest are: political communication as a field and as a practice; the mediatisation of politics; populism; political culture; identity politics; communicational government; political leadership; social media and the development of pseudo-voice.